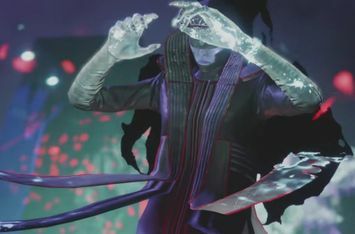 Kalli is an Awoken Techeun who served Queen Mara Sov before being Taken by Oryx and transformed into Kalli, the Corrupted. She was freed from the Taken corruption by a fireteam of Guardians led by the Young Wolf. She is the first boss of the Last Wish raid. Kalli sought the position of Coven Mother. Before the fateful Battle of Saturn Kalli was part of a rare meeting with the Coven, discussing what to do about Oryx, the Taken King. Kalli was instructed to take the youngest Harbingers and "plant them" inside the Dreadnaught, "a dead thing to have children of their own". Kalli was later Taken after sending the Harbingers, with Oryx activating the Dreadnaught's superweapon to obliterate the Awoken fleet in retaliation. When the Guardian first reached the Dreaming City, Kalli was present along with her fellow Taken Techeuns. Upon the Guardian's approach, she and her sister Techeuns immediately banished them into the Ascendant realm, forcing them to escape. Eventually, Kalli became one of the last lines of defense against the Guardian Raid team that sought to slay Riven, and was freed from her Taken corruption after being weakened. In "The Coven" Grimoire card, Kalli's name is spelled with two Ls while in "Telesto" it is spelled with one. Kalli could be a reference to Kali, a Hindu goddess of time, creation, destruction, and power.